Congolese leader Jacques Bahati of the Africa Faith and Justice Network recently returned from a visit to mining communities in eastern Congo and published an interesting report on his findings. The visit concluded that while the SEC continues to delay its decision on the Dodd Frank section 1502 for conflict mineral reform, people in Congo are left hanging in a state of ambiguity. Failure to formalize and enforce the reform process will undercut ongoing work towards long-term sustainable development in the region. Concerned groups like AFJN are stressing the importance of guaranteeing strong SEC rules and a speedy implementation process. 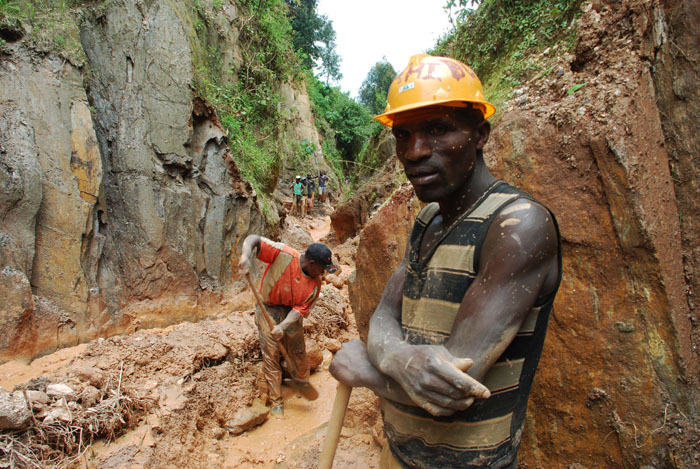 Based on a field trip to the Mukera gold mine and other areas in eastern Congo in February, Bahati’s AFJN report highlights how artisanal miners in this region are continually affected by mineral trade corruption. AFJN also calls upon companies to begin their own due diligence processes in lieu of a timely and judicious ruling from the SEC. Despite these severe limitations, some Congolese citizens are attempting to take reform into their own hands. They have formed several mining cooperatives throughout the region, which aim “not only to organize artisanal miners to defend their rights, but also to help improve their skills and tools, professionalize their work, and fight the plundering of their resources,” Bahati wrote. However, for these initiatives to succeed, they need the support of outside influential actors, such as the United States. The report examines the pivotal role that the Congolese government must play in reforming its own mining sector, but also recognizes the low possibility of this actually happening—especially without significant pressure from foreign investors. U.S-led reforms such as the ones proposed in section 1502 are needed to bolster on-the-ground efforts by members of Congolese civil society and to send a message to the Congolese government, making it clear that it is in their best interest to secure an end to illicit trading and associated violence in the East. AFJN calls upon companies to move ahead with reforms regardless of when the SEC ruling is released by following due diligence guidelines such as those set up by the OECD and the U.N. Several socially responsible companies have already initiated this process and are working to further their efforts in the region. Take action today and demand that the SEC makes releasing a strong set of rules a top priority.